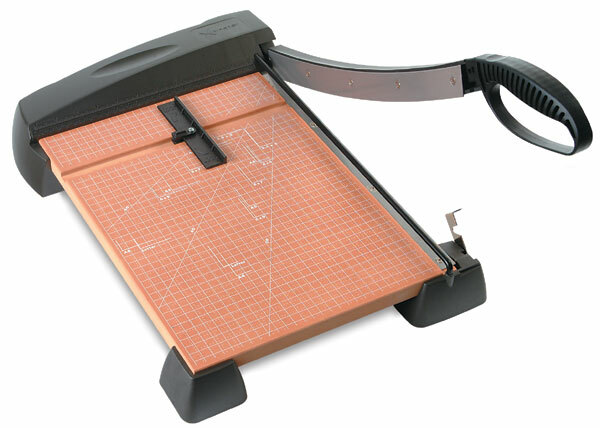 X-Acto's Heavy-Duty Wood Trimmer features a self-sharpening hardened steel blade that can cleanly cut 15 sheets of 20 lb paper. An adjustable sliding paper guide locks for perfect alignment. Precision ruled inch and metric scales make accurate measuring simple. The trimmer's easy-grip handle makes cutting comfortable, and the heavy wooden base has rubber feet to prevent sliding and protect your work surface. A safety guard conceals the blade edge, while a safety lock secures the blade when not in use.